Dru Angelides, 7, and his mom, Rebecca Grant, ride to Geiger Elementary School in Lewiston during National Bike to School Day on Wednesday. The second-grader joined about 60 of his schoolmates, parents, staff and Lewiston Community Resource Officer Joe Philippon during their commute. “On a normal school day, we might have 10 bikes on the bike rack,” said event organizer Bruce Hall, who rode to school with his son, Jason. “Bike to School Day should be every day,” educational technician Anne Behnke said. “It’s good for you. I don’t miss a day. … If I’m late, I catch bus 13,” Behnke said. “May is Bike and Walk to School Month,” said Darcy Whittemore of the Maine Safe Routes to School Program. Students wrote down what they like about bicycles once they arrived at Geiger Elementary during National Bike to School Day in Lewiston on Wednesday. PORTLAND, Maine – Starting later this week and continuing through the summer, the City of Portland in partnership with the Maine Department of Transportation will construct multiple Safe Routes to School funded projects in three neighborhoods, East End, East Deering and North Deering. First, construction will begin in the East End on two shared-use pathway projects that also include enhancing safe pedestrian and bicycle crossings at two locations (see attached graphics). The first project will widen the existing 5’ wide sidewalk along Washington Avenue from the Eastern Prom to connect to the pathway on the I-295 Exit 8 southbound off-ramp. The project will construct a 10’ shared-use path separated from the roadway by a 4’-6’ wide grassed esplanade. The crossing of Washington Avenue at Eastern Promenade will also be enhanced by a pedestrian refuge island and pedestrian-activated flashers. The second project reconfigures the ramp from Washington Avenue to Anderson and Plowman Streets to include a 10’ wide shared-use pathway. The crossing of the ramp at Washington Avenue will be enhanced by shortening the crossing distance, higher visibility crosswalk markings, and adding pedestrian-activated flashers. This path will create bicycle and pedestrian access to and from East Bayside and the Bayside Trail to Munjoy Hill and Tukey’s Bridge/the Back Cove Trail/East Deering. While work is underway on these two projects, bicyclists and pedestrians will generally be required to use alternate routes to access the shared-use pathway on Tukey’s Bridge and the Back Cove Trail from the East End. Signs will direct path users to use alternate routes when access is closed within the work area. Work is expected to be complete in four weeks. The third project, scheduled to begin in July, will enhance two existing pedestrian crossings serving the Presumpscot Elementary School in East Deering. Both crossing locations will have ADA-compliant curb ramps installed, pedestrian refuge islands constructed, and add pedestrian-activated flashers. The fourth project, also to be completed in July, will upgrade the existing pedestrian warning/crosswalk signs at the crosswalk across Washington Avenue at Maine Avenue with a pedestrian-activated flasher system. While the projects are underway, motorists are advised to be mindful of pedestrians and bicyclists in the work zone. Motor vehicle traffic will be maintained through each of the work zones. The projects are funded with a combination of federal, state and local Safe Routes to School funds targeted to create a safer walking and bicycling environment for elementary and middle school students. (Portland, ME) May 1, 2013 – May is Walk and Bike to School Month in Maine and students in over 30 schools from Fort Kent to York and from Rangely to Lincolnville have announced that they will be celebrating as they commute on foot or by bicycle. A list of activities, dates and locations is available on-line here. Parents, teachers, students, and volunteers at each school have organized fun and engaging activities such as walking school buses (children walking with adult supervision) and walking field trips, bike trains and biking field trips (groups bicycling with adult supervision), as well as bike safety rodeos and after-school bike clubs. Some schools will hold one-day celebrations, while others plan walk and bike to school events for a whole month or the entire spring. May is also National Bike Month and a number of schools will hold bike-to-school events to celebrate the 2nd Annual National Bike to School Day on May 8. “Events are fairly easy to organize and build great local enthusiasm – and spring can be an especially good time to organize activities as the weather improves,” shared Darcy Whittemore, Program Manager for the Maine Safe Routes to School Program. 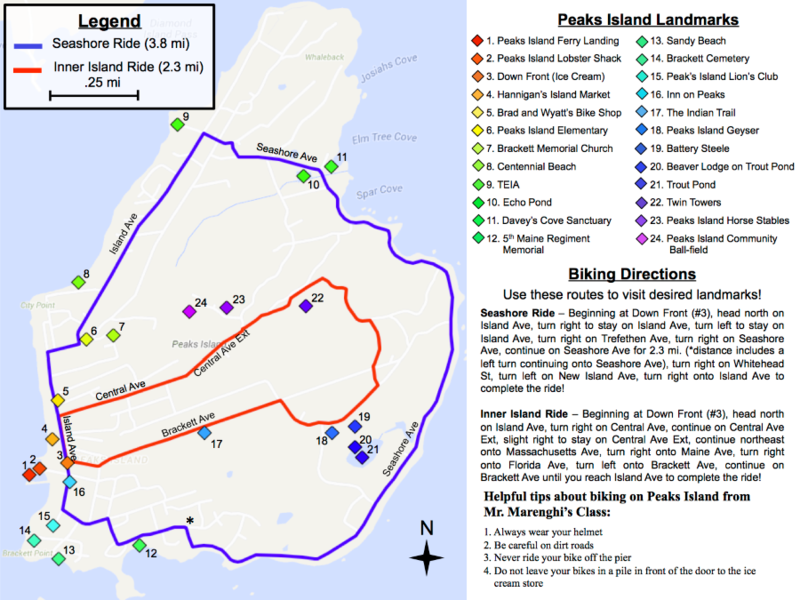 Communities already registered to participate in walk and bike activities this spring include: Bangor, Bath, Biddeford, Bridgton, Camden, Fort Kent, Gray, Hampden, Kennebunk, Lewiston, Lincolnville, Madawaska, Madison, Milford, Monmouth, Naples, New Gloucester, North Berwick, Oakland, Pittsfield, Portland, Rangeley, Raymond, Saco, Scarborough, Sebago, South Portland, Topsham, Winterport and York. It is likely that additional schools also will participate. About the Maine Safe Routes to School Program – Established in 2001, the Maine Safe Routes to School Program assists communities in enabling and encouraging children to safely walk and bicycle to school. Federally-funded since 2005, the Maine Safe Routes to School (SRTS) Program is a partnership of the Maine Department of Transportation, the Bicycle Coalition of Maine, and communities throughout the state. The program provides technical support and over 190 Maine schools have participated in various Safe Routes to School activities, with many expanding their initiatives involving bicycle and pedestrian safety education, and encouragement and incentive programs to get more students and their families walking and biking. In Maine, 90% of the Safe Routes to School Program funding (the maximum allowed under the SAFETEA-LU federal transportation bill) have been used to build physical infrastructure to make it safer for students to walk and bicycle to school. Infrastructure examples include sidewalks, crossing improvements, off-road connections, improved signage, etc. Since 2005 over 40 Maine communities have been awarded SRTS infrastructure improvements funding. 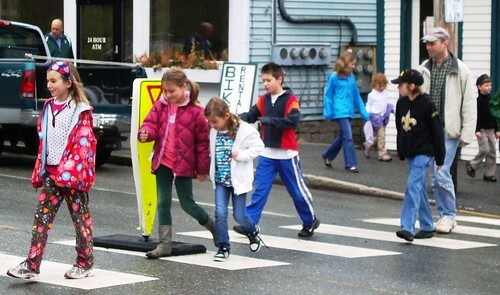 “These federally-funded safety improvements have been extremely helpful in creating safer pedestrian and bicycle travel and reducing traffic congestion around schools in communities throughout the state,” said Dan Stewart, Bicycle & Pedestrian Program Manager for the Maine Department of Transportation.